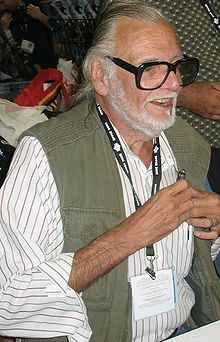 George A. Romero (1940–2017) was an American-Canadian film director, writer, editor and cinematographer. He contributed to many projects as either the writer, director, editor, cinematographer or a combination of the four. Romero's first project was the 1968 horror film Night of the Living Dead, which he produced independently. Romero was also a contributing producer for the anthology television series Tales from the Darkside, which aired from 1983 to 1988. 1990 Tales from the Darkside: The Movie Yes Segment "Cat from Hell"
Romero was featured and voiced alongside Robert Englund, Sarah Michelle Gellar, Danny Trejo and Michael Rooker in a downloadable content pack in Call of Duty: Black Ops as a zombie boss in "Call of the Dead", the zombie map included in the content pack named "Escalation". "George A. Romero - Filmography". Allmovie. Retrieved 2013-07-01. "George A. Romero on Rotten Tomatoes". Rotten Tomatoes. Retrieved 2013-12-01.